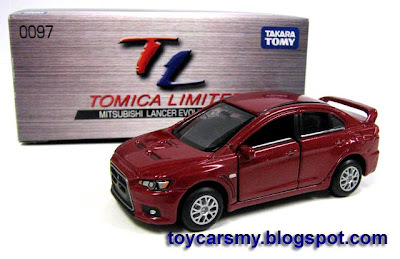 Just got it today fresh from the Litt Tak shipment box, Tomica Limited Mitsubishi Lancer Evolution X launched in July 2008. Despite it is from same casting with the #67 regular series, the limited models has more trims and finishing added to the car. 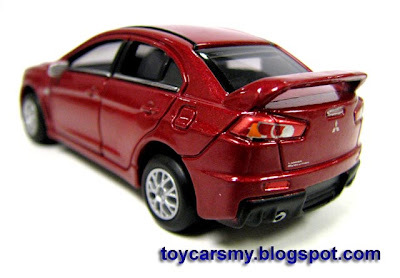 A very obvious difference is both front and rear lights are painted with details. Front grill has silver trim with embedded intercooler. 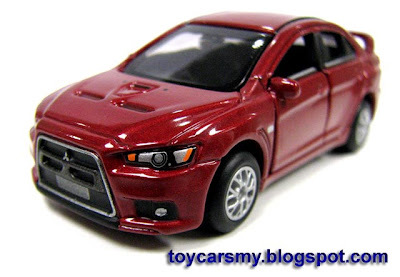 Not to mention the rubber tyres and side mirror added realistic feeling to the model car. What else to say, get one for yourself at RM19.90. Not bad looking this one. Plenty more at Jusco 1 Utama!! !